brickstoredeal has no other items for sale. Blending the genres of fantasy, mystery, horror, and drama, "Harry Potter and the Sorcerer's Stone" is more of a phenomenon than merely a book. A tale about a young boy who discovers he's a wizard, it's sprinkled generously with comedy and puns. It also features grand adventures and explores themes like love, loyalty, good versus evil, and the enduring power of friendship. This magical world exists right alongside mundane, everyday reality, and readers discover its secrets along with the characters. Follow Harry as he leaves his non-magical, "muggle" life for the Scottish Highlands to attend the wizarding school, Hogwarts. His new-found friend, Hagrid the half-giant, reveals early details of Harry's past, answering lifelong questions. Along the way, they visit a wizard bank and buy a wand for Harry at a magical store in Diagon Alley. This secret street in London also features a seller of magical creatures, cauldrons, books, and sweets. New friendships are made as he boards the Hogwarts Express, bound for his magical school. Harry soon learns he will have to face villainous sorcerer Voldemort, whose evil spell he barely escaped as an infant. Voldemort is after a mythical stone belonging to the philosopher Nicolas Flamel. Harry must find the stone belonging to the philosopher first and save the day. If he doesn’t, he will risk the sorcerer Voldemort becoming more powerful. Readers can revisit the beginning of the tale in a brand-new way with "Harry Potter and the Sorcerer's Stone: The Illustrated Edition." This 256-page hardcover book by Rowling features eye-catching artwork by Jim Kay. Over 100 illustrations are present in the book and depict pivotal scenes in the story. As the first edition of the series, the same magic can be relived all over again in the illustrated book. This edition takes the imaginative tale and transforms it into a work of visual art. While the Potter books possess significant scholastic merit, this version can also be enjoyed for its artistic beauty. Colorful illustrations can draw the eye of interested children. They can check for their favorite characters, scenes, and locations on each page. Longtime Harry Potter devotees will enjoy revisiting the vivid images and enthralling tale in the illustrated book. Alternatively, this book makes a fantastic gift for a new fan looking to begin a magical literary journey. 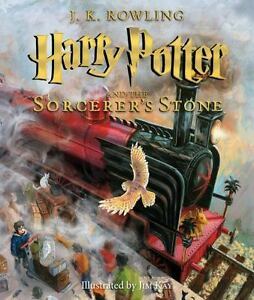 Harry Potter and the Sorcerers Stone Illustrated Ed. It's a wonderful book with many beautiful pieces of art work. Re reading this new version with al it's beautiful art was wonderful. I highly recommend it even if you've read it before. The pictures are very well done and perfect for my 5 year old grandson who needs a few pictures in his books at this early age. I would have given it 5 stars but our copy has many damaged pages, which look like it was done in production. Pleasantly surprised by the amount of illustrations and the level of detail they contained! What I love about the illustrations is how many there are and how detailed they are. There are pages with full illustrations, half-illustrations and sometimes just little ink or paint drops on the pages. There's Snape who looks more evil in sinister in Book 1, and I hope that Kay gradually shows his transformation through the coming books. There's a door with names carved into it of important book characters like Lupin, Riddle, and even JKR scrawled somewhere on it. And then, there's the glorious sorting hat! Kay's Sorting Hat is no cheap looking black hat with a mouth, but a colorful, stitched together monstrosity that looks like it has more of a story to tell than the movie one ever did. The book is sturdy. Not every page has pictures, but the ones that do are is exactly what I expected, and the style match the cover of every other Harry Potter book. I cant wait for the rest of the series to be illustrated! Purchased this illustrated book for my now college student, but we read the Potter series together and when he opened this gift Christmas morning he was so excited and he said he couldn't wait to reread the illustrated copy! !